Brandon Wimbush took another step on Saturday in his progression as the starting quarterback as he led Notre Dame to another win in their quest to make their first ever appearance in the college football playoff. The Irish ended up beating Wake Forest 48-37 in what was an explosive offensive performance without their Heisman hopeful running back, Josh Adams. The Irish finished with 710 yards of total offense on the day, just 13 yards shy of their all-time record. Wimbush who finished 15 or 30 for a career high 280 yards and a passing touchdown also added an additional 110 yards on the ground on 12 carries for a 9.2 average and two more touchdowns. While Wimbush continues to be a well-rounded dual threat quarterback, it was his progression in the pass game which impressed those watching him on the night. 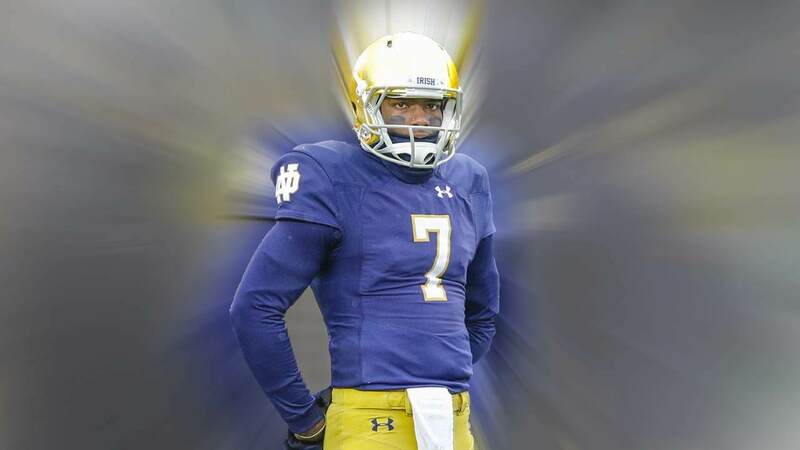 Wimbush took a significant step in his evolution as a passer, reading the field better and finding his open targets. His stat-line could have been even more impressive if his receivers hadn’t dropped a handful of passes which would have led to a more impressive completion percentage. What’s more, backup quarterback Ian Book came in at the end of the second quarter on the goal line while Wimbush was out with a hand contusion to throw a picture perfect touchdown to a wide open Nic Weishar on a four tight end set that the offense had been practicing all week. That was a play that coach Kelly said that Wimbush was disappointed not to have been in to make himself. On a night where upsets were everywhere in the making, with Ohio State and Penn State both losing on the road while Clemson and Oklahoma both had scares of their own, it was natural for Notre Dame to have a bit of a let down as their defense didn’t perform up to standard. As Notre Dame had their nearly historic offensive night, Wake Forest also had an impressive offensive performance of their own as the offense led by senior John Wofford in his 40th start looked sharp executing an up-tempo scheme which gave the Notre Dame defense fits. The Wake Forest offense looked like a team that had been practicing against a Mike Elko led defense for three years and were able to anticipate what the Irish were going to do and dictate play on that side of the ball. As senior defensive captain Drue Tranquil noted after the game, Wofford was able to stare him down the entire game and make the right decision in the run-pass option for the big play. Assisted by several missed assignments and broken tackles, Wake Forest put up 587 yards of their own and ran it for three rushing touchdowns, after the Irish allowed only one the entire year leading up to this game. While Wake Forest played well and kept the final score respectable, this game wasn’t as close as the score would indicate. Having gone up 31-10 heading into the half, ESPN’s predictor had Notre Dame with over a 99% chance of winning the game and at no point in the second half did it dip under. While the defense will have several things to work on before heading down to play an undefeated Miami team on the road, the college football playoff committee will likely chalk this one up as an easy win for a team that played less than inspired who were also missing their talismanic running back. And while the defense will be looking to rebound, the offense must be feeling good about itself with the emergence of Brandon Wimbush as a passer and the addition of Chase Claypool as another lethal weapon on this Irish offense as he finished for 180 yards on nine receptions and a touchdown which included a pair of drops which could’ve brought his tally even higher. Confidence is high in South Bend, and it will be important to bring it all together as they look to beating an undefeated Miami team on the road and take their next step to the college football playoff. The image in this article is used with permission from IrishSportsDaily.com.